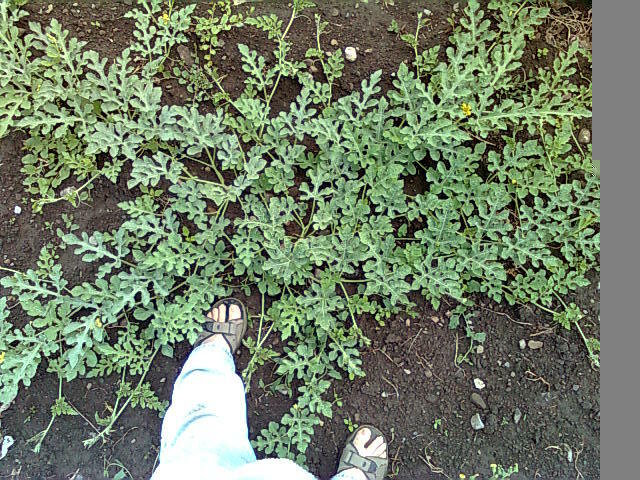 In the 2011 growing season I started a genetically diverse open pollinated land-race of watermelon that is being selectively adapted to thrive on my farm with it's cold nights, hot arid days, bright high-altitude sunlight, and short growing season. Before the start of the growing season seeds were shared among 2 growers in a similarly short-season cold climate, and one grower in a warmer climate. Ali Baba, Allsweet, AS, Arikara, Asahi Miyako Ibrida, Black Diamond, Black Diamond Yellow Belly Strain, Black Seeded Ice Cream, Blacktail Mountain, Bozeman, Carolina Cross #183, CFMCM 2010, Charleston Gray - Paradise Subvariety, Chelsea, Chris Cross, CIT 128, CIT 182, CIT 183, Citrillus, Congo, Cream of Saskatchewan, Crimson Sweet, Dakota Rose, Densuke, Desert King, Dixielee, Diyarbakir, Early Canada, Early Moonbeam, Giza, Gold Flower, Golden Midget, Green JB, Hokkaido Black, Hopi Yellow, Ice Cream Flavored, India, Janosik, King and Queen, Kitro, Kleckly, Little Light, Mickeylee, Moon and Stars, Navajo Red-seeded, Navajo Sweet - Dayton Nevada strain, Navajo, New Hampshire Midget, Orangeglo, Osh Khirgizia, Quetzali, Red Shine Citron, Royal Golden, San Juan Sangria, Scorik ultra early, Small Red, Small Shining Light, Strawberry, Sugar Baby, Sweet Round, Sweet Siberian, Takii Gem. Tendersweet Orange, Verona, Wills Sugar, Yellow Doll, yellow-fleshed watermelon, Yellow JB, Yellow Jubilee, Yellow & Green Colour Fruit, Медовый Гигант, Огонёк, Подарок Солнца, Сибирские Огни, (Honey Giant, Spark, Gift of the Sun, Siberian fires). Between the Sun and Moon Mass Cross of "close to 100" varieties, and an "absolutely huge mass cross" Red Watermelon Grex. The primary selection criteria was that the plant must grow well enough to set fruit in my garden. I am not intending to maintain a hybrid swarm for watermelons. 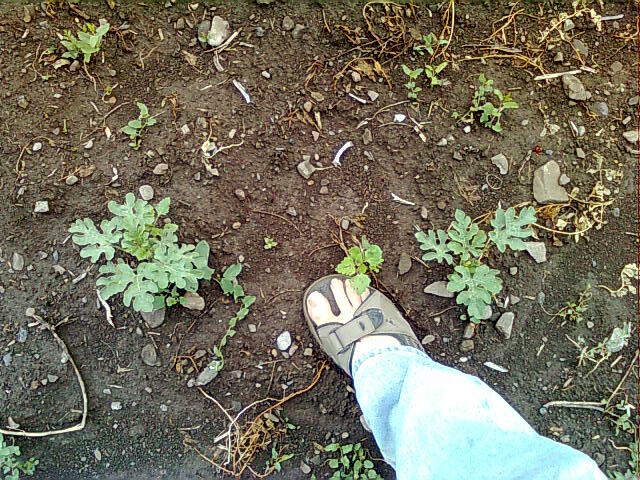 In the 2011 growing season 5 fruits were harvested from my garden out of more than 600 seeds that were planted. The 3 collaborating breeders had varying degrees of success. We traded seeds all around. To demonstrate how successful the program has been at identifying suitable germplasm, photos were taken of plants seeded on the same day a few feet from each other. If you have short season varieties (less than 90 days) that you would like included in the trial, please send seeds to my post office box. In return I can offer respect, or seeds either now or this fall when the the crop is harvested. We are looking for additional growers in low-humidity cold short-season high-altitude areas to join our collaborative breeding program.